Marasmioid species are often tiny, and can be overlooked by collectors. However, they play an essential saprobic role in forest ecosystems, helping to break down the litter layer of the forest floor. In fact the litter layer, particularly in oak-hickory woods in eastern North America, is often teeming with marasmioid mushrooms, even when conditions are extremely dry and hot. Aside from their "marcescence" (the mycological term for their reviving ablility), marasmioid mushrooms are recognized by the white spore print; the tiny to small, flat-to-convex (not conical) caps; the often wiry stems; the habitat on needle duff, leaf litter, or woody debris; and microscopic features. Even so, confusion with collybioid mushrooms, mycenoid mushrooms, and several other groups is pretty much a given when it comes to identification of marasmioid species. Identifying marasmioid mushrooms sometimes hinges on microscopic examination, though some species have distinctive colors, textures, odors, and tastes to help narrow down the possibilities. Whatever you do, don't pick one tiny marasmioid mushroom and expect to identify it. You'll need several--many, even--in order to assess various features. And be sure to take note of your mushrooms' ecology; many species are limited to certain substrates and ecosystems. Microscopic features for marasmioid mushrooms are best assessed with a Roman aqueduct section, since the morphology of the pileipellis, cheilocystidia, and pleurocystidia are all potentially important. Many marasmioid species feature "broom cells" as cheilocystidia and/or as terminal elements of the pileipellis; these are funky cells that vary in stature and shape but feature rodlike to fingerlike or knoblike outgrowths. The traditional genus Marasmius, to the surprise of no one who has paid any attention at all to mushroom taxonomy over the last decade, is beginning to be untenable in a contemporary, DNA-based taxonomic world. Already new arrangements of marasmioid mushrooms are arising, and genus names like Rhizomarasmius and Mycetinis are coming into circulation (or, in the latter case, re-circulation) for species that used to belong in Marasmius--and more genera and arrangements are undoubtedly on the horizon. 1. Decomposing debris of plants (grasses, sedges, rushes, ferns, flowers, vines, etc.). 2. Growing in grassy areas, in troops or fairy rings; cap 1-5 cm across and usually broadly bell-shaped, buff to tan; gills well spaced. 2. Cap much smaller (rarely over 15 mm across); growing in grassy areas or not. 3. On litter of salal and Oregon grape; odor of garlic; Pacific Northwest. 3. Substrate different; odor not distinctive; variously distributed. 4. On litter of mountain avens or on living avens; arctic and alpine ecosystems. 4. Substrate different; variously distributed. 5. Fresh cap white, buff, or pale (perhaps with a slightly darker center); western species. 5. Fresh cap more highly colored; eastern and western species. 6. Mature cap to only 2 mm across, buff to pale fawn with a cinnamon center; spores 8-12 x 4-6 µ. 7. Cap pure white; spores 13-16 x 5-6.5 µ. 7. Cap whitish with pinkish to cinnamon tinges over the center; spores 8-9 x 4 µ. 8. Base of stem without prominent basal mycelium or fuzz; spores 7-11 x 3-5 µ. 8. Base of stem with mycelium or fuzz; spores variously sized. 9. Pennsylvania to Louisiana and Illinois; spores 13-19 x 3.5-5 µ. 9. Widely distributed; spores 8.5-10.5 x 3.5-4 µ. 10. On debris of conifers. 10. On debris of hardwoods. 11. Odor of garlic or onions, or strong and foul (crush a cap between your thumb and finger). 12. Odor strong and foul, but not of garlic or onions; on needles of spruce, fir, or pine (one or two mushrooms per needle); cap dull brown, beige, or nearly white. 12. Odor distinctly of garlic or onions. 13. Mature cap extremely tiny (under 3 mm across); whitish, dull pinkish, or brownish gray. I see no convincing way to separate these two species, with or without a microscope. 13. Mature cap larger than above (4 to 20 mm across); more highly colored. 14. Stem surface more or less velvety. 15. Scattered or in loose troops on litter of pines (Pinus species); maximum cap size about 10 mm; stem base inserted directly into needles; spores 7.5-9 x 3-4 µ. 15. In dense troops on litter of Douglas-fir, true firs (Abies species) or pines (Pinus species); maximum cap size about 20 mm; stem base not inserted directly; spores 9-10 x 5-6 µ. 16. Fresh cap whitish to very pale grayish or faintly pinkish. 16. Fresh cap more highly colored. 17. Growing from needles; gills not developing pinkish stains; stem remaining fairly pale; spores 9-10 µ long. 17. Growing from twigs or small logs; gills often developing pinkish stains; stem darkening from the base up with age; spores 12-19 µ long. 18. Fresh cap rose, pink, red, wine colored, purple-red, etc. 18. Fresh cap otherwise colored (orange, brown, orangish brown, cinnamon, rust, olive brown, yellow brown . . . ). 19. Cap conspicuously pleated; rose pink, fading to pinkish with a darker center; growing on needles east of the Rocky Mountains. 19. Cap not conspicuously pleated; more highly colored when fresh; growing on various substrates; western. 20. Growing on well decayed wood; cap 5-20 mm across; gills often with a tiny tooth running down the stem; spores 8-13 x 3-4 µ. 20. Growing on humus; cap 10-40 mm across; gills often nearly free; spores 11-15 x 5-6.5 µ. 21. Cap conspicuously pleated; eastern species. 21. Cap somewhat lined or not, but not conspicuously pleated; eastern and western species. 22. Fresh cap orange to brownish orange; common from about Tennessee northward; spores 16-23 x 3-4 µ; odor not distinctive; taste mild to slightly bitter; large cystidia with refractive contents present. 22. Fresh cap cinnamon or rusty brown; common from about Tennessee southward; spores 15-18 x 3-4.5 µ; odor and taste often mealy; cystidia absent or rare (if present, without refractive contents). 23. Cap olive brown, fading to light yellowish brown, pale olive brown, or grayish brown (the center often darker than the margin); often growing with ferns nearby; stem with a long root that extends into the substrate; spores shaped like lemons. 23. Cap without olive tones; root lacking; spores otherwise shaped. 24. Growing on debris of redwoods on the West Coast; cap brown to brownish orange or orangish, 6-12 mm wide; taste (not odor) strongly garlic-like after 1-2 minutes. 24. Not completely as above. 25. Cap more or less "brown," without orange shades. 25. Cap with orange to orange-brown shades, fading to dull apricot. 26. Cap pale brownish or yellowish brown, with a darker brown center; gills without cystidia. 26. Cap medium brown to dark brown; gill edges with upside-down mutant cow udders in miniature ("diverticulate" or "broom" cells) as cystidia. 27. Growing from twigs or small logs; cap white, not pleated; stem darkening from the base up; gills often developing pinkish stains; spores 12-19 µ long. 27. Not completely as above. 28. Growing on debris of madrone, tanoak, sycamore, black locust, birch, quaking aspen, black cottonwood, or American holly. Several of the subsequent species are not repeated later in the key. 28. Growing on debris of other hardwoods. 29. Growing on petioles of sycamore leaves; cap minute, pale becoming pinkish brown. 30. Growing on bark litter of madrone; cap to 1 cm across, brown; odor and taste of garlic or onions. 31. Growing on litter of black locust; cap 4-13 mm across, pale orange (usually darker over the center and paler marginally), strongly or faintly pleated; recorded from Michigan but probably to be expected throughout the range of the tree. 32. Growing on leaf litter of American holly; cap minute, pale with a darker brownish center. 33. Gills attached by means of a collar that encircles the stem. 33. Gills attached directly to the stem. 34. Growing on debris of tanoak. 34. Growing on debris of birch, quaking aspen, or black cottonwood. 35. Odor of garlic or onions; cap 5-10 mm across, dark reddish brown. 35. Odor not distinctive; other features variable. 36. Cap to 6 mm across, dark brown fading to light brown. 37. Cap tiny (5 mm across maximum) and whitish. 38. Growing on leaves of birch or quaking aspen; spores 8-11 µ long; basidia 4-spored. 38. Growing on leaves of black cottonwood (Populus trichocarpa); spores 11-14 µ long; basidia 2-spored. 39. Odor of garlic or onions (crush a cap between your thumb and finger). 39. Odor not distinctive, somewhat foul, spermatic, bleachlike, mealy, or radishlike--but not of garlic. 40. Stem bald; most spores under 10 µ long; cheilocystidia digitate with many fingerlike projections. 40. Stem hairy to finely velvety; most spores longer than 10 µ; cheilocystidia lumpy and lobed, with only a few, vaguely fingerlike projections. 41. Found in western North America. 41. Found east of the Rocky Mountains. 42. Fresh cap rose pink, red, purplish red, or wine colored. 42. Fresh cap otherwise colored. 43. Found in western North America. 43. Found east of the Rocky Mountains. 44. Growing on well decayed wood; cap .5-2 cm across; gills often with a tiny tooth running down the stem; spores 8-13 x 3-4 µ. 44. Growing on humus; cap 1-4 cm across; gills often nearly free; spores 11-15 x 5-6.5 µ. 45. Cap rose pink, fading to pinkish with a darker center. 45. Cap purple red to red, perhaps fading to reddish brown. 46. Gills pinkish, often with red edges; spores 16-22 x 4-5.5 µ. 46. Gills whitish to yellowish, the edges colored like the faces; spores 8.5-12 x 3-4 µ. 47. Mature cap rarely as wide as 2-3 cm; stem wiry or not. 48. Cap whitish with a dark brown or reddish brown center; found in eastern North America. 49. Entire stem remaining pale (whitish to yellow or very pale brownish) throughout development. 49. At least the lower portion of stem dark (brown, reddish brown, orange-brown, etc.) by maturity. 50. Growing from leaf litter; cystidia present only on gill edges. 50. Growing from leaf litter, twigs, or logs; cystidia present on gill faces and edges. 51. Fresh cap pale (whitish, yellowish, pinkish cinnamon). 51. Fresh cap some shade of brown. 52. Mature cap whitish with a very slightly darker center, becoming somewhat wrinkled; gills with dextrinoid cystidia (setae). 52. Mature cap pinkish cinnamon with a paler margin, not usually wrinkled; gills with colorless cystidia and broom cells. 53. Often growing in clusters of 2-3 mushrooms; gills with dextrinoid cystidia (setae). 53. Usually growing scattered to gregariously; gills with colorless to yellowish cystidia and broom cells. 54. Fresh cap white or nearly so (pale yellowish, buff, cream). 54. Fresh cap more highly colored. 55. Cap smooth to wrinkled or faintly lined, but not conspicuously pleated. 56. Usually growing on sticks, woody debris, and logs; cap at maturity with a flat top in side view. 56. Usually growing on leaves; cap at maturity evenly rounded-convex in side view. 57. Cap minute (2 mm maximum width); growing on leaves of American beech. 58. Stem surface smooth or minutely pubescent. 58. Stem surface finely to prominently hairy (use a hand lens on fresh specimens). 59. Cap 2-13 mm across; usually growing on sedges, rushes, ferns (etc.) but also recorded on twigs of alder, willow, beech, tulip poplar, sycamore, pine, and hemlock; cystidia not dextrinoid. 59. Cap 7-40 mm across; usually growing on twigs or leaves of oaks, but recorded on debris of other hardwoods; cystidia dextrinoid. 60. Entire stem remaining whitish or pale brownish over the course of development. 60. At least the bottom portion of the stem darkening to brown, dark brown, or black with maturity. 61. Growing from hardwood leaves or leaf stems, or from grasses or vines; pileipellis a hymeniform layer of broom cells. 61. Growing from hardwood sticks; pileipellis a cutis with lobed or slightly diverticulate terminal elements. 62. Stem soon black except at the apex; spores triangular to jack-shaped. 62. Stem becoming brown to dark brown (if blackish, only at the base); spores ellipsoid to pip-shaped. 63. Threadlike black rhizomorphs often found in the substrate (sticks); gills sometimes discoloring orangish with age; pileipellis with setae; spores 13-20 µ long. 63. Rhizomorphs absent; gills not discoloring orangish; pileipellis without setae; spores 8-13 µ long. 64. Color of fresh cap ranging from orange to orange-brown to rusty or reddish brown. 64. Color of fresh cap ranging from brown to light brown to yellow-brown to tan or olive brown. 65. Mature cap conspicuously pleated or prominently lined. 65. Mature cap smooth or faintly lined, but not conspicuously lined or pleated. 66. 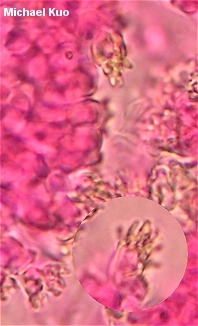 Spores under 12 µ in length; cap initially brown to yellow-brown but sometimes fading to orangish brown; growing on leaves. 66. Spores longer than 12 µ; cap with orange or rusty shades from the beginning; growing on leaves or woody debris. 67. Cap 3-8 mm across; rare; documented from Tennessee. 67. Cap larger than above; common throughout eastern North America. 68. Found in northeastern North America from roughly the 43rd parallel northwards; many spores under 15 µ in length; odor reminiscent of Pleurotus ostreatus. 68. Found south of the 43rd parallel or perhaps above it; nearly all spores longer than 15 µ; odor not distinctive or mealy. 69. Fresh cap orange to brownish orange; common from about Tennessee northward; spores 16-23 x 3-4 µ; odor not distinctive; taste mild to slightly bitter; large cystidia with refractive contents present. 69. Fresh cap cinnamon or rusty brown; common from about Tennessee southward; spores 15-18 x 3-4.5 µ; odor and taste often mealy; cystidia absent or rare (if present, without refractive contents). 70. Stem densely hairy, long and usually rooting somewhat; cap cuticle without broom cells. 70. Stem smooth or very finely hairy, usually not rooting; cap cuticle with broom cells. 71. Found in northeastern North America from roughly the 43rd parallel northwards; spores over 12 µ in length; odor reminiscent of Pleurotus ostreatus. 71. Widely distributed; spores shorter than 12 µ; odor not distinctive. 72. Apparently limited to eastern North America; cap 6-25 mm across, bright orange or dark orange-brown when fresh; broom cells and cystidia present on gills. 72. Apparently widely distributed in North America; cap 4-12 mm across, orange to orangish but rarely bright orange; broom cells present on gills but not cystidia. 73. Basal half of stem remaining fairly pale through maturity. 73. At least the basal half of the stem dark brown to black by maturity. 74. Stem usually eccentric (sometimes central); stature minute (cap 1-7 mm across, stem under 3 mm long). 74. Stem usually central (sometimes slightly erratic); small but not minute (cap 3-24 mm across, stem 26-40 mm long). 75. Usually growing on curled, blackened ash leaves (but recorded on elm, poplar, and other hardwood leaves); cap minute (under 4 mm across), grayish brown to light brown. 75. Not completely as above. 76. Growing on leaves of oaks or tanoak in western North America; cap minute (2-5 mm across), light brown over the center and paler marginally. 76. Not completely as above. 77. Stem quite long (60-100 mm long), with a scurfy surface. 77. Stem shorter than above (between 5 and 65 mm long), with a smooth to faintly hairy or pubescent surface. 78. Spores under 12 µ long. 78. Spores over 13 µ long. 79. Cap conspicuously pleated at maturity; stem smooth; odor spermatic; spores 16-24 µ long. 79. Cap wrinkled or somewhat lined along the margin at maturity, but not conspicuously pleated; stem faintly hairy or pubescent; odor not distinctive; spores 13.5-18 µ long. Abesha, E. et al. (2003). Population genetics and spatial structure of the fairy ring fungus Marasmius oreades in a Norwegian sand dune ecosystem. Mycologia 95: 1021-1031. Antonin, V. et al. (1997). Generic concepts within the groups of Marasmius and Collybia sensu lato. Mycotaxon 63: 359-368. Blenis, P. V. et al. (1997). Evaluation of fungicides and surfactants for control of fairy rings caused by Marasmius oreades (Bolt ex. Fr.) Fr. HortScience 32: 1077-1084. Desjardin, D. E. (1985). New marasmioid fungi from California. Mycologia 77: 894-902. Desjardin, D. E. (1987). The Agaricales (Gilled Fungi) of California. 7. Tricholomataceae I. Marasmioid Fungi: the Genera Baeospora, Crinipellis, Marasmiellus, Marasmius, Micromphale, and Strobilurus. Eureka, CA: Mad River Press. 99 pp. Desjardin, D. E. (1987). New and noteworthy marasmioid fungi from California. Mycologia 79: 123-134. Desjardin, D. E. & Petersen, R. H. (1989). Studies on Marasmius from eastern North America. II. New species. Mycotaxon 34: 71-92. Desjardin, D. E. (1991). Studies on Marasmius from eastern North America. IV. Additions to Sect. Sicci. Mycologia 83: 30-39. Desjardin, D. E., S. A. Gordon & R. H. Petersen (1993). Observations on two rhizomorph-forming species of Marasmiellus. Mycological Research 97: 111-122. Desjardin, D. E. (1997). A synopsis of Marasmiellus in the southern Appalachian Mountains. Mycotaxon 65: 237-261. Doyle, M. F. & Sundberg, W. J. (1989). The taxonomy, ecology, and distribution of Marasmius (Agaricales, Tricholomataceae) in Illinois. Transactions of the Illinois Academy of Science 82: 109-120. Farnet, A. M. et al. (1999). Genotypic variations among isolates of Marasmius quercophilus, a white-rot fungus isolated from evergreen oak litter. Canadian Journal of Botany 77: 884-890. Gilliam, M. S. (1975). New North American species of Marasmius. Mycologia 67: 817-844. Gilliam, M. S. (1975). Marasmius section Chordales in the Northeastern United States and Canada. Contributions from the University of Michigan Herbarium 11: 25-40. Gilliam, M. S. (1976). The genus Marasmius in the northeastern United States and adjacent Canada. Mycotaxon 4: 1-144. Gordon, S. A. & Petersen, R. H. (1997). Infraspecific variation among geographically separated collections of Marasmius androsaceus. Mycological Research 101: 365-371. Gordon, S. A. & Petersen, R. H. (1998). Infraspecific variation among geographically separated collections of Marasmius scorodonius. Mycotaxon 69: 453-466. Gordon, S. A. et al. (1994). Mating systems in Marasmius: Additional evidence to support sectional consistency. Mycological Research 98: 200-204. Halling, R. E. (1983). A synopsis of Marasmius section Globulares (Tricholomataceae) in the United States. Brittonia 35: 317-326. McFarland, K. P. & Rimmer, C. C. (1996). Horsehair fungus, Marasmius androsaceus, used as nest lining by birds of the subalpine spruce-fir community in the northeastern United States. The Canadian Field-Naturalist 110: 541-543. Petersen, R. H. (2000). Rhizomarasmius, gen. nov (Xerulaceae, Agaricales). Mycotaxon 75: 333-342. Singer, R. (1958, 1959). Studies toward a monograph of the South American species of Marasmius. Sydowia 12: 54-145. Singer, R. (1973). The genera Marasmiellus, Crepidotus and Simocybe in the neotropics. Germany: J. Cramer. 517 pp. Wilson, A. W. & D. E. Desjardin (2005). Phylogenetic relationships in the gymnopoid and marasmioid fungi (Basidiomycetes, euagarics clade). Mycologia 97: 667-679.